There have been many controversial moments in the over forty year career of Progressive Rock trailblazers Yes, but probably none more so than back in 1980 when they replaced singer Jon Anderson and keyboard player Rick Wakeman with Buggles duo Trevor Horn and Geoff Downes. 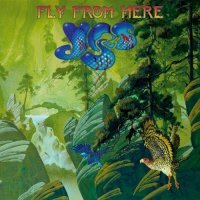 Almost a decade after their last completely new record, 'Magnification', 'Fly From Here' is only the second Yes album not to feature the vocals of Anderson, and again features Horn and Downes, although Horn's job is solely that of producer with previously unknown Canadian vocalist Benoit David taking on Jon Anderson's role. Consisting of a twenty-three minute title track in six parts, and five other stand alone tracks, it's the lengthy concept piece that's probably the most worthwhile thing Yes have done since Trevor Rabin was still in the band. Starting with the instrumental 'Overture', it soon leads into the punchy 'We Can Fly', a song that first surfaced in a slightly different guise during the 'Drama' era and was originally played live by that version of the band. Here it's been polished up and sounds great, with dynamic keyboard and guitar parts, Horn's fantastic production and vocalist Benoit David sounding like a cross between Anderson and Horn. Similarly 'Sad Night At The Airfield' is another fine Drama-like song and 'Madman At The Screens' is enjoyable too and hints at 'Machine Messiah' in parts, although the last two short parts of the saga don't really add anything to what's gone before and the segues are a little bit less smooth. As a single piece it works quite well and Downes' work in particular is nicely layered with some great retro synth sounds, but I'm sure that some Yes fans won't like the fact that some of this music isn't new and was released as bonus tracks for the second Buggles album just after their first spell in Yes. The remaining five songs are a bit of a strange hotch-potch, for instance the Chris Squire song 'The Man You Always Wanted Me To Be' features the man himself on lead vocals and is quite simple for the first three minutes before erupting into a great bass line and catchy refrain for the last two, it's quite reminiscent of his work with Billy Sherwood in Conspiracy. 'Life On A Film Set' is quite the opposite, being a quirky tune from the old Buggles days that's excellent for the first couple of minutes before an abrupt change into a silly part that's actually quite annoying. 'Hour Of Need' is pretty unusual too as it's one of the very few proper Yes songs that's completely written by guitarist Steve Howe, who even shares the lead vocal with David. It's quite a short and simple tune and even has an Oliver Wakeman keyboard solo that his Dad would have been proud of, and it sets up the Howe acoustic guitar instrumental 'Solitaire', which is enjoyable enough but hardly 'Mood For A Day' or 'The Clap'. The album ends with the stirring 'Into The Storm', which is one of the stronger tracks and has a 'Tormato'-like vibe. It's interesting that this song is written by the whole band with Horn and Oliver Wakeman, but not Geoff Downes. 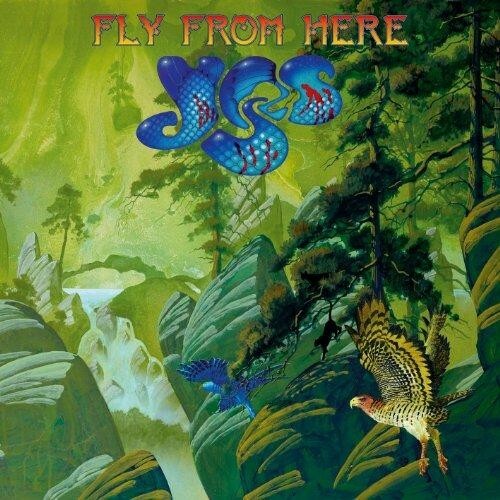 Whilst there will be some who'll avoid this album because of the situation surrounding the 'sacking' of Jon Anderson, I'm sure most Yes fans are used to these wholesale changes and will take 'Fly From Here' at face value. It's not perfect by any means, but it's better than anything they've released since 'Talk'.